Golf Writer Andy Reistetter continues his exclusive “Play-Write” series on the Mississippi Gulf Coast. On a recent golf travel assignment he was introduced to four golf courses- The Bridges, The Oaks, The Preserve and Fallen Oak where the Champions Tour’s Mississippi Gulf Resort Classic is held in March. 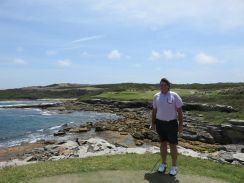 Join Reistetter as he not only plays golf in some very special places but enjoys true Southern hospitality in some unusual places. Friend Reistetter on Facebook for a look at more behind-the-scenes pictures and insights. 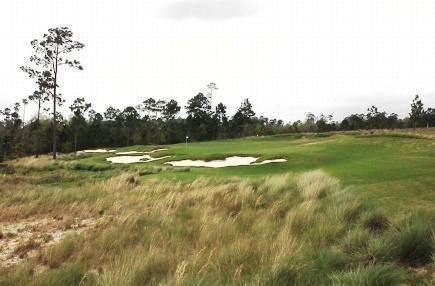 Signature 16th hole at The Preserve, a Jerry Pate design. I played four Mississippi golf courses in four days! 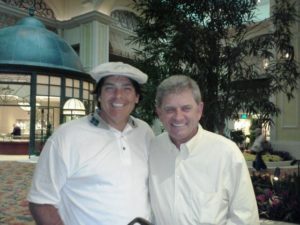 Well almost, the most anticipated fourth round playing with Nick Price in the pro-am at Fallen Oak was cancelled due to an overnight rain storm. Any other golf course, any other day we would have played but preserving the condition of the golf course is of paramount importance when you are scheduled to host a Champions tour event the next day. The Tom Fazio design looked spectacular on television as Fred Couples won yet another championship. I can’t wait to return to the Magnolia State to play Fallen Oak. 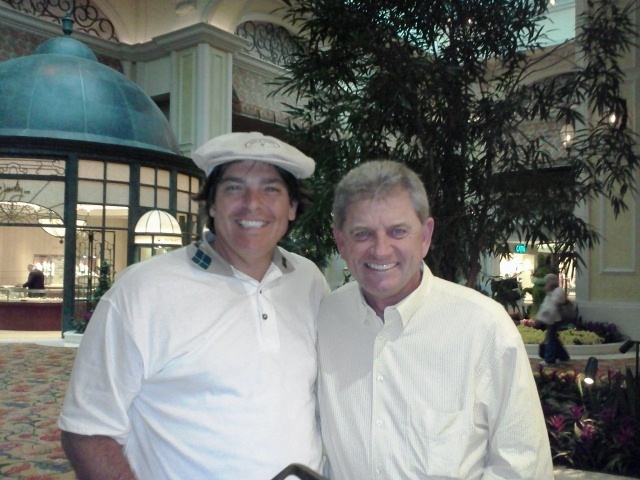 Sadly Mr. Hickory Golf did not get to play golf with Nick Price but I did get to hang with him for a little bit… the Hall of Famer is as nice as everyone says he is! Mississippi “packs the punch” when it comes to a golf and coastal life style. Yes its 44 miles of coastline is far less than that of Florida (1350) and California (840). So too is the number of golf courses- Mississippi (124), Florida (1218) and California (906). If you look at the ratio of golf courses to coastline miles Mississippi (2.8) has three times the intensity of Florida (0.9) and California (1.1). The bottom line is once you arrive, don’t expect to drive far to play a variety of golf courses and enjoy the coast as well. I explored the coastal region of Mississippi from west-to-east. 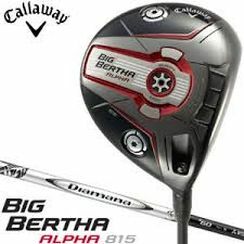 I played The Bridges and stayed at the Hollywood Casino Resort in Bay St. Louis the first day. Where there are bridges there are water hazards. This Arnold Palmer signature design is a fair test of golf in a tranquil and scenic setting. 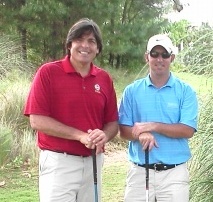 At The Bridges with Head Golf Professional Billy Baumgartner. On the second day I headed over to The Oaks in Pass Christian where Golf Channel’s Trip Isenhour set the course record with a third round 64 on his way to victory in the 2000 Buy.com Mississippi Gulf Coast Open. This is where the eye of Katrina passed over yet many oak trees remain to challenge your course management skills. With Hooter Girls as beverage cart attendants this must be a favorite of John Daly as well. Heading east my last stop was a few nights at the smoke-free Palace Casino Resort in Biloxi. The name of the Head Golf Professional at the resort’s Preserve Golf Club- Chris Champagne says it all when it comes to the quality of this golfing experience. Throw in Golf Superintendant Stephen Miles and his trusted Golden Retriever Tucker on the golf cart and you know the playing conditions are pristine and memorable. Jerry Pate the 1976 U.S. Open and inaugural PLAYERS at TPC Sawgrass champion is the golf course designer. You won’t forget his par-3 16th hole with its scraggly-edge bunkers and sweeping green. Hooters Girls are Beverage Cart Attendants at The Oaks in Mississippi. Photo courtesy of Hooters restaurant of Gulfport, MS. I highly recommend lunch at The Preserve in the Sweet Bay restaurant. I had the seafood gumbo, hardwood smoked brisket drizzled with Jack Daniels BBQ sauce and the sweet potato nuggets. The meal was so good that I would go back with only a table and no tee time reservation. As good as lunch was, dinner at Mignon’s in the Palace Casino Resort was even better. After sampling a variety of appetizers including BBQ shrimp, fresh oysters and crab cakes I feasted on the namesake filet. The dinner was hosted by Lisa Quirch who manages public relations for the resort. She’s been there 16 years, starting the day before it opened. Perfect for the job since she likes meeting people and people like meeting her. The three story barge casino that Katrina put out of business on August 29 is now located on the first two floors of the 236 room and suite 11-story hotel. Lisa help put 500 people back to work before the end of the year and it is those people, their hospitality that is hard to find elsewhere. 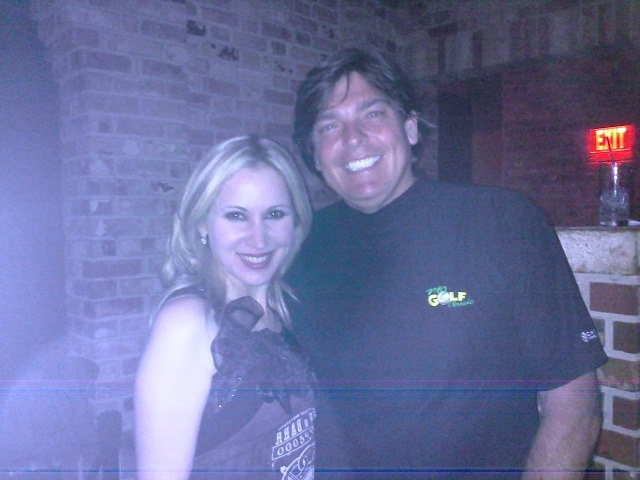 With singer & performer Diane Diaz. Since the fourth round was a rainout I took a quick shuttle over to the Coast Nightclub at the Beau Rivage to catch Las Vegas regular Dianne Diaz’s show. Talk about an up close and personal experience. Great club, great show! 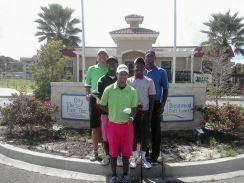 Though I was disappointed we did not get to play in the pro-am honestly the day off the golf course was more fun. I recommend adding another off-day to any golf trip visiting Mississippi. Lunch at The Phonecian and a walk around Ocean Springs was the perfect respite from golf. Ocean Springs is the Cabot Cove of Mississippi. I met Laurel Luckey, the new editor of the Gazette, by chance. With a name like that I wanted to take her to the casino with me. She went to Ole Miss and came back via New York City and will likely add even a bit more zest to her hometown. Another nice young lady named Mabelle gave me a ride over to the Walter Anderson Museum of Art. I could have moseyed except for the brief rain shower. I was mesmerized by the biographical video of the mysterious, Rod Serling like artist. He ventured out to Horn Island to renew his youth and in the process created some artful renditions of birds and their habitat. 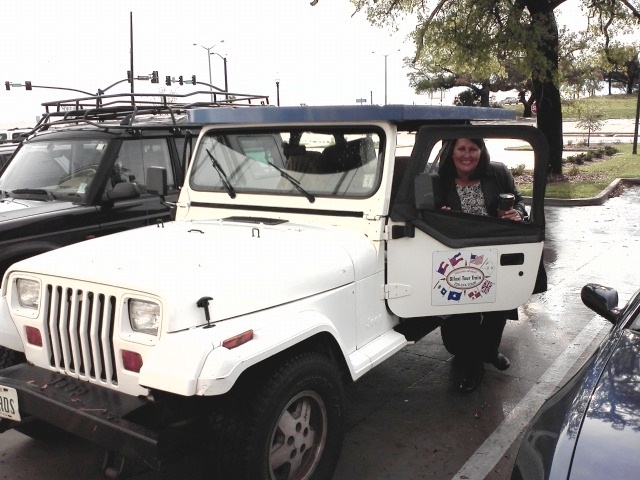 Biloxi tour operator Carla Beaugez… no hurricane will stop this lady from giving a tour of her hometown. Then I met Carla Beaugez of the Biloxi Tour Train who took me on a private tour that I will never forget. For sure she is the Angela Lansbury of Biloxi. While there was no murder to solve she revealed the mystery of Biloxi by noting at the start that “it is the humblest of humanity, not a melting pot.” Hurricanes have a way of bringing the strengths of people to the forefront. Carla lost the original train engine in Katrina and now makes due using her jeep to pull the passenger cars for her tour. Her tour wasn’t what I expected, it was so much more. “If you ride with Carla you are a celebrity,” sounds like a cliché but isn’t. Yes you get the basics such as “the original Biloxi Lighthouse was made in Baltimore, Maryland and shipped in pieces by barge.” But you also get the personal insider view when she pulls over in front of the Old Biloxi Schooner restaurant and Tabitha and Inga come out on the sidewalk to chat with you for a while and offer you a Barq’s Root Beer. 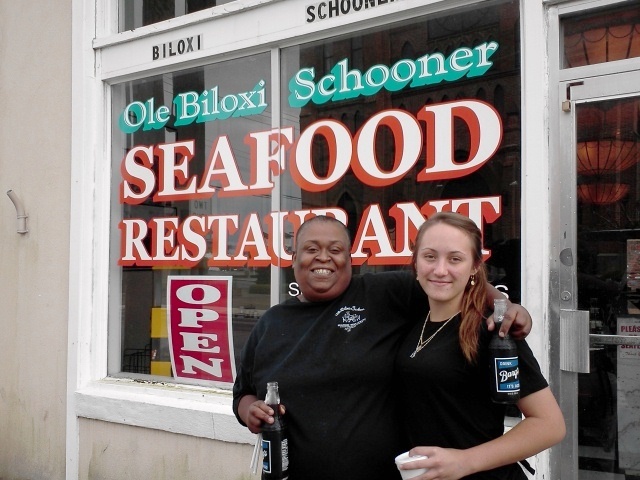 The people of Mississippi are as nice, friendly and hospitable as ever… note the sign in the window… the Mississippi Gulf Coast in open for business! Whichever way you go in Mississippi I think you will find the warmth of its people and understand why it is also known as The Hospitality State. What is great about the state of Mississippi is that the Coastal Region is only one of five tourist sections. The four other regions are the Capital/River, the Pines, the Hills and the Delta. Did you know that the Mississippi River is the entire western border of the state? I did not realize that and look forward to returning to explore the rest of Mississippi someday very soon. For more information on golfing in Mississippi go to the website Visit Mississippi where you will be able to access complete information about the golf courses throughout the state, including stay-and-play packages. Andy Reistetter is a freelance golf writer as well as a Spotter, Research and Broadcast Assistant for The Golf Channel, NBC and CBS Sports. 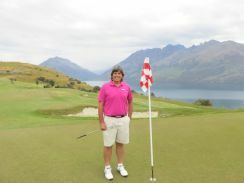 He spends time on all four major American golf tours- the PGA TOUR, Champions, Nationwide and LPGA Tours. Reistetter resides within two miles of the PGA TOUR headquarters and the home of The PLAYERS Championship at TPC Sawgrass in Ponte Vedra Beach. A lifetime golfer, Andy enjoys volunteering at the World Golf Hall of Fame and THE PLAYERS while pursuing his passion for the game of golf and everything associated with it.